Last Gasp: Draw three different random 1-cost creatures from your deck. Brass Arquebus is an epic Neutral creature card. It is part of the Clockwork City story set. A playset of the card is awarded for completing The Last Stand. The premium version can only be obtained by soul-summoning, which is only possible after the completion of The Last Stand. 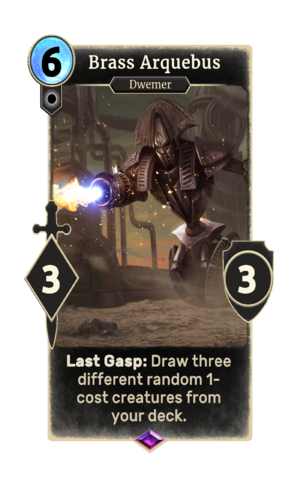 This card is named "Refabricated Arquebus" in the game-files, which would have referred to a Dwarven Sphere from ESO.